On Monday night I attended a soiree organized by a work contact of mine. It was a holiday party and I always adore those: people are in a festive mood, food is served, wine is consumed and party dresses are worn. What is there not to love?! This party, on the Upper East Side, certainly lived up to all expectations. Channeling a bit of LA rockstar meets Kate Moss, I felt quite stunning in my beautiful All Saints ruffled silk dress and brown cropped leather jacket. My brown suede Louboutin heels finished the all-chocolate tones look and I allowed my hair to dry naturally straight for a last understated touch. All was in place for a great evening. Silly me, I thought everyone at the party would be in a “Festivus” mood, so I let my defenses down. I talked to people I have noticed to be less than supportive of me, and joked with new-found acquaintances who would hardly fit in my inner circle of friends. But that’s the great thing about parties, NYC and being in the holiday spirit, it makes everything seem OK. While I chatted with an artist woman friend of mine, a sixty-something man with a bit of a chip on his shoulder – maybe due to his amazingly annoying wife! – cut into the conversation we were having. “What are you girls talking about” already putting us down to the level of seven-year-olds with the “girls” reference. My artist friend jokingly answered “We are figuring out how to find Nina a man”. As quick as lightening, though he had been waiting all his life to utter the words, Mr. Personality chimed back “If she can’t find a man, she doesn’t deserve to have one!” Ah, yes… “Of course, this comes from your great experience of being a woman in NYC? !” was my comeback, which achieved the desired effect of getting us off that subject. We continued joking around, even if he had not meant his comment as a joke at all, and I was glad to move on to a different guest, a more welcoming personality and a kinder conversation in less than two minutes flat. But ultimately, though he was rude and spiteful in his comment, Mr. Personality is a reflexion to what most out there are actually thinking. Recently someone reported of a conversation they were having with someone else about me, with the other person saying ‘What is wrong with Nina that she’s not married? !” which of course was not meant to come out THAT way but represented the true meaning of an otherwise well-intentioned thought. And when I advised the same person of a recently ended fling with a sort-of just known enough actor, his immediate reaction: “I didn’t know you were aiming so high!” As if I should only direct my eyes and heart at vagrants and serial losers, you know, types more appropriate for a woman like me?! 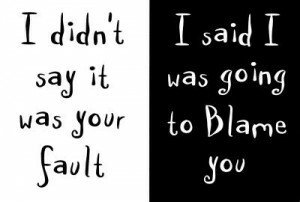 So, is it really all my fault? While I tried to explain my life to my artist friend, after our run-in with Personality Saab, I tried to keep in mind that our experiences in this world are always the result of our choices. But there is an element of luck in finding our soulmate. I mean, there is at least one for each of us, out there somewhere. What if mine lives in the Galapagos and even if I were to meet him – say, while turtle sightseeing there – he would need more than a casual introduction to realize that I’m indeed his soulmate? And NYC is definitely the least relationship-friendly city on earth. Milan, with its Mammonis – Italian for “Mama’s boys” – and Los Angeles with its age-obsessed, botox-injected men are a piece of cake compared to the Big Apple. We are constantly tempted here and there is always someone greener on the other side. Even a woman with the self confidence of steel like me ends up feeling insecure at many a turn in NY. So what is your modern fairy tale? I’d love to share your story here, at The Ajnabee. This entry was posted on Monday, December 27th, 2010 at 12:00 pm and is filed under Modern Fairy tale, Woman About Town. Absolutely loved your write up Nina. Not to mention the smooth flowing style you have. Will try and send you my modern fairy tale soon. Thanks for the opportunity! Love your site – keep up the great work!